I wasn’t sure when I got a link to a Facebook group to buy cards but with a the title of “$2.00 and Under Sports Cards Sale,” I couldn’t resist. I took a chance and it payed off. As you can see my total was $4 and change, and that includes shipping. As someone who isn’t a fan of Facebook, I found myself checking Facebook a few times a day because of this group. 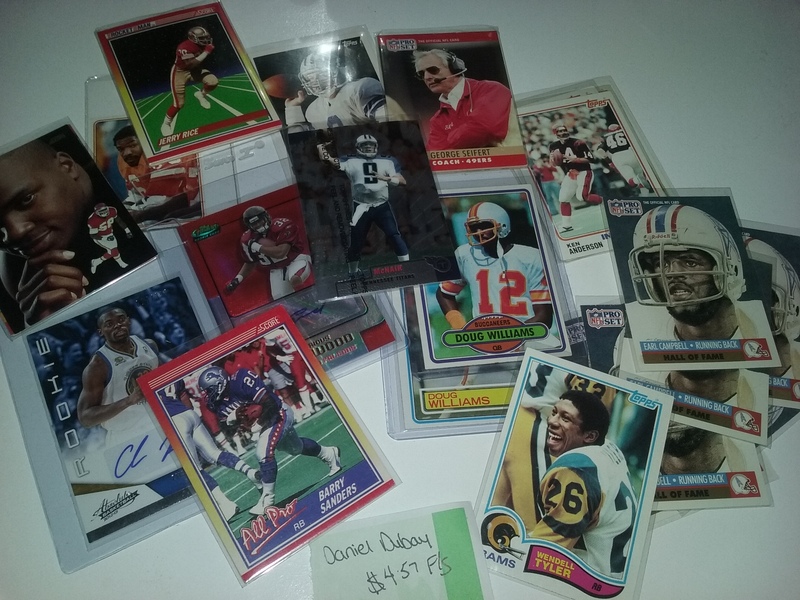 I came across a bunch of items that were actually on my want list, namely old 49ers cards. The highlight for me was the handful of George Seifert cards; the guy coached 2 of my favorite times ever: Steve Young’s 49ers and the Carolina Panthers. I actually think that I got those cards for free. It was the perfect group for me, a small time collector on a tinier budget. Check it out at: https://www.facebook.com/groups/1644257969142322/. So far, the people who run it seem very cool. As a shameless plug for the current giveaway, I did add one of the Earl Campbell cards I got into the lot.